Deadpool’s journey from pulp to cinema took many twists and turns. People were worried that a big movie studio wouldn’t let Marvel’s “Merc With a Mouth” be true to the comics. Some were worried that the Deadpool movie couldn’t possibly live up to the outstanding marketing campaign that preceded it. I’m incredibly happy to tell you that the movie is all that and then some. The movie is true to one of Marvel’s most unique characters and Fox’s best comic-book movie to date. Now let’s break it down using the hallowed RPadTV binary system. Naturally, turn on your spoiler shields! Deadpool was so enjoyable that after the movie was over, I thought to myself, “You’re forgiven, Ryan Reynolds. It’s all good.” It took a remarkable effort (maximum effort!) and a great performance to redeem him, but Reynolds did it (to my delightful amazement). Best. Opening. Credits. Ever. (Good): I can’t even spoil this one for you. It was too good. It even had little Easter eggs, like Rob L’s cup of coffee. Perfect Tone (Good): As expected, there were some changes from the source material, but the tone of the movie and the character were spot on. The combination of Reynolds’ performance, sharp writing, crude language, and ridiculous action made the movie feel like the real Deadpool. Of course it wasn’t as literal as The Watchmen, but Deadpool is still among the most faithful movie adaptations of a comic book. Daario Nawhatshisface (Bad): One of the movie’s few weaknesses was Ajax. The movie version of the villain was totally “generic British baddie.” Actor Ed Skrein had a few fun moments, but his performance was otherwise flat. Also, I couldn’t stop seeing him as Daario Naharis v1 from Game of Thrones. I’m pretty sure all Game of Thrones fans that see Deadpool will recognize him. Those summer teeth are unforgettable. Angel Dust (Bad): While Gina Carano made for a menacing villainess, I was bummed that this role was a budgetary amalgam. Originally, the cast of baddies was larger. For monetary reasons, the characters of Garrison Kane, Sluggo, and Wyre were mashed into Angel Dust. I’m particularly fond of the Kane character, so it was a bummer that he didn’t make the cut. While Carano had some nice fight scenes, her acting is…pretty much what you’d expect from an ex-MMA fighter. Fourth Wall Follies (Good): One of the most entertaining aspects of Deadpool (the comics character) is his penchant for breaking down the fourth wall. Deadpool (the movie character) does this too and he does it well. It would have been easy to lean too heavily on this device, but I think the writers kept it on the right side of the line between entertaining and overzealous. The fourth-wall humor and constant pop-culture references are two of the reasons the Deadpool character is unique and they had to be part of the movie. Witty words delivered sharply by Reynolds made it work. Negasonic Teenage Warhead (Good): Okay, the movie version of the character is nothing like the comics version, but it totally worked. Brianna Hildebrand had a small role in the film, but she maximized her screen time. She was great as an angsty teen mutant with energy-based powers. Plus, it’s just fun to say and type Negasonic Teenage Warhead. Negasonic Teenage Warhead, Negasonic Teenage Warhead, Negasonic Teenage Warhead — see?!? Surprisingly Heartfelt (Good): One aspect of the movie that I wasn’t expecting was effective romance. Ryan Reynolds and Morena Baccarin had great onscreen chemistry, making the romance between Deadpool and Vanessa believable. The movie had a shocking amount of romantic charm, making it one of the few comic-book movies that works for a Valentine’s Day date (provided you’re dating or married to a cool chick). Ultra Violence (Good): Like the comics, the Deadpool movie has a zany type of violence. Fierce gunplay, acrobatic swordsmanship, and physical comedy were blended together marvelously. There was a nice contrast between Deadpool’s dynamic fight scenes and Colossus’ power moves. The brief “fight” between Deadpool and Colossus was frickin’ hilarious. Music Sweet Music (Good): You have to give it up for a movie that effectively uses Juice Newton, Salt-N-Pepa, Neil Sedaka, Chicago, and Wham! in the same soundtrack. Bring On the Director’s Cut (Good): I’m looking forward to watching a longer edit of the movie. As it is, the pace of the theatrical release is just about perfect for a mainstream audience. As a lifelong comics nerd, I want more — especially more scenes with Weasel and Blind Al. I love both of those characters and the talent playing them in movie is fantastic. Bottom Line: Deadpool exceeded my expectations. I was expecting a movie packed with raucous action and lewd humor. While the movie did have those elements, it also had deeper characterization than I was expecting, as well as smarter writing. Deadpool has been one of my favorite Marvel characters for decades and I’m thrilled that Fox did him justice on the big screen. Again, I’m comfortable saying that this is Fox’s best comic-book movie to date. More importantly, I’m happy to say that Deadpool makes up for the travesty that was Green Lantern. Thank you, Ryan Reynolds, for championing this movie and delivering a fantastic performance. The best thing that I can say about the Fantastic Four 2015 reboot is…that it was better than Green Lantern. That movie was traumatically horrid. Fantastic Four isn’t quite that bad, but it felt incomplete — as if the studio released a rough cut of the movie or an entire act was missing. It’s certainly not a good movie (superhero or otherwise), but I was surprised by how unfinished it felt. It doesn’t have a grand climax or a profound sense of resolution. Instead you’re left with a feeling of, “That’s it?” Whether it’s in a bedroom or in a movie theater, you don’t want that feeling. In the grand RPadTV tradition, here’s a binary breakdown of the 2015 Fantastic Four movie. Flaccid Four (Bad): Someone involved in the making of this superhero movie doesn’t like superhero movies. Fantastic Four lacks the standard superhero movie devices of epic battles, a stentorian soundtrack, and cool special effects. The movie’s finale was such a letdown. When the Fantastic Four finally fought Dr. Doom, the buildup was slow…and then suddenly the fight was over. Whether it was the director, the editor, or the studio, the people involved with this movie took the Fantastic Four and made them a fantastic bore. Dr. Doom (Bad): Why, why, why can’t a movie portray Dr. Doom properly?!? It’s confounding. He’s one of the best villains in the Marvel Universe! Comics Doom is an awesome combination of science and sorcery. While much of the world fears him, the people that he rules love him. Many of his actions are driven by mommy issues (i.e. love). He’s arrogant and capable, with just enough vulnerability to make him sympathetic. In the last two Fantastic Four movies, Doom was an evil businessman. In this one, he’s an angry tech geek. In all three films, he lacked the confidence, competence, and heart that make Doom such a brilliant character in the comics. Kate Mara (Good): On the plus side, Kate Mara was the best part of the movie (visually). She wasn’t great as Sue Storm/The Invisible Woman, but she did an adequate job and will satisfy those that felt Jessica Alba was too dopey in the last two Fantastic Four movies. I am, of course, biased when it comes to Kate Mara. She’s alluring and she comes from a wealthy family. It’s fun watching her on a big screen while you dream about her making you a kept man. 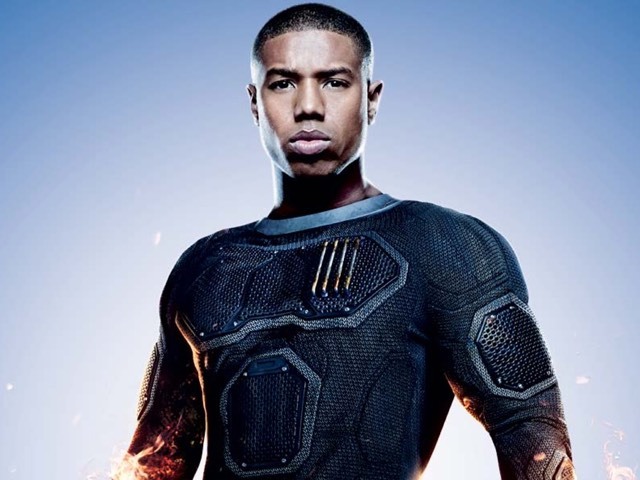 Michael B. Jordan (Bad): When Jordan was announced as Johnny Storm/The Human Torch, some fans were livid that an African-American actor was cast as a white-bread character. What they should really be mad about is that he completely sucked in the movie. Jordan was easily the worst lead in the Fantastic Four. While the rest of the cast did a reasonable job of movie-level acting, Jordan brought his WB-level game to the film. He was so bad that I have high hopes of him replacing Paul Walker as my favorite crappy actor. If Jordan adds a bit of charm to his inept acting then he has a good chance of getting there. Franklin Storm Rocked (Good): The best actor in the movie wasn’t one of the four main protagonists or the sole villain. He was a supporting character — Reg E. Cathey’s Dr. Franklin Storm. His performance was easily the best in the movie — dude has a wicked voice that adds gravitas to his scenes. Oyster Bay Why?!? (Bad): For reasons that seem random, the movie’s version of Reed Richards and Benjamin Grimm grew up in Oyster Bay. My personal problem with this is that there’s a cutaway scene in Oyster Bay where the Manhattan skyline is shown. I lived in Oyster Bay for a few years. Unless you have a really tall house and a very powerful telescope, you cannot see Manhattan from Oyster Bay. The scene reminded me of Jackie Chan’s Rumble in the Bronx, when a cutaway of the Statue of Liberty was shown. Similar to how you can’t see the Statue of Liberty from the Bronx, you simply can’t see Manhattan from Oyster Bay. The bigger issue pertains to Ben Grimm’s character. 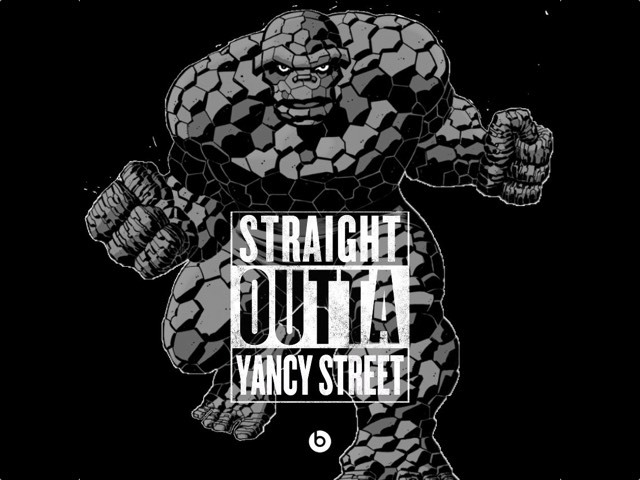 In the comics, he grew up on the Lower East Side on Yancy Street. His older brother was killed in a gang fight. Grimm’s rough big-city upbringing is a huge part of his identity and The Thing’s rocky exterior is a metaphor for his tough shell that covers a soft heart. Going deeper, comics Thing has several personal elements from his creator, Jack Kirby. “The King” grew up on the Lower East Side on Delancey Street and had an older brother that died when he was young. The movie’s change in locales makes no sense geographically and is insulting to the character’s creator. Not the Least Bit Fantastic: Honestly, Fantastic Four isn’t as bad as some people are making it out to be. It felt like it was a little more than halfway to being a decent superhero movie. Whether it was the directing, editing, or studio meddling, something went terribly wrong and the end product was poor. Again, it’s not nearly as wretched as Green Lantern (an admittedly low bar) and has a few moments that were superior to anything from the last two FF films. At the end of the day, Fox bungled Marvel’s first family of superheroes. The movie definitely isn’t worth seeing in theaters and certainly not worthy of a Blu-ray purchase. When it gets in cable rotation then perhaps you can justify watching it out of curiosity, but there are better superhero films to spend your time with. 7 Days is Hell is a wonderfully absurd and surprisingly raunchy made-for-TV short film currently playing on HBO. Starring Andy Samberg and Kit Harington as a pair of polar opposite tennis players, the movie is a mockumentary that skewers so many things — tennis, sports documentaries, Sweden, sports moms, British talkshows, the Queen of England, and more. Although 7 Days in Hell parodies a wide variety of topics, director Jake Szymanski does an admirable job of keeping the movie focused. If you’re a fan of tennis or sports documentaries (think HBO Sports numerous documentaries and ESPN’s 30 for 30 series) and don’t mind smutty humor then you should definitely give 7 Days in Hell a shot. Andy Samberg does most of the heavy lifting in 7 Days in Hell as Aaron Williams. The adopted brother of tennis legends Serena and Venus Williams, Aaron is a physical pastiche of Andre Agassi, but with the personality of John McEnroe…with the lewdness cranked up to 11. Samberg does a fantastic job of playing a character that’s brash and obnoxious, but charming and vulnerable enough that you don’t hate him. On the other side of the net is Kit Harington’s Charles Poole. Trained to be a tennis superstar since he was a child, Poole has a terror of a sports mom and few redeeming qualities outside of his athleticism. While Samberg owns many of the scenes in 7 Days in Hell, Harington was pleasantly subtle as Poole. Best known as the heroic Jon Snow on HBO’s Game of Thrones, Harington plays a character that’s wonderfully dim and vacant — the perfect contrast to the over-the-top Williams. In order to make 7 Days in Hell feel like an authentic sports documentary, there are several cameos from athletes, analysts, and newscasters. Serena Williams, John McEnroe, Chris Evert, Soledad O’Brien, and Jim Lampley help make the movie seem like a real HBO sports production. Fred Armisen and Will Forte help make fun of the overly serious tone of many sports documentaries as a pair of fictitious tennis historians. Rounding out the cast are a bunch of characters playing themselves in a tongue-in-cheeks manner, including magician David Copperfield and movie star Dolph Lundgren. Without spoiling anything, their involvement in 7 Days in Hell is most excellent. As a fan of the game of tennis and someone that has watched dozens of sports documentaries, I had a feeling that I’d enjoy 7 Days in Hell. The movie was different from what I was expecting. It’s far more crass and sexual than I thought it would be, but the real surprise was how deftly the director managed the short film’s tone. I was very, very impressed by how seamlessly 7 Days in Hell alternated between crass humor and witty satire. Juggling the two contrasting forms of comedy into a congruous experience is difficult and director Jake Szymanski handled things excellently. While I love the pomp and circumstance of Wimbledon, 7 Days of Hell is a refreshing take on a sport that many view as stuffy and elitist. While the over-the-top humor will appeal to many viewers, the real joy of the film will be had by those that know tennis and sports documentaries. That said, the mockingly serious take on an absurd situation featuring two absurd characters is so good, that there’s a chance 7 Days in Hell will be enjoyed by people that don’t like sports at all. With a runtime of 43 minutes, I recommend giving the movie a shot. If you like it, I recommend watching it again because there’s a lot of subtle and background humor that you’ll probably miss the first time around. If you’ve watched 7 Days in Hell, I’d love to hear your thoughts on it. Please share your musings in the comments section. Now excuse me, as I’m about to give the movie a third viewing.